1) Perform a search of any kind WITHOUT using one of the media limits. This search can be a search of a specific index (e.g., AUTHOR, TITLE, SUBJECT, etc.) or a KEYWORD search. We apologize for the inconvenience this is causing, and hope to have this corrected soon. This entry was posted in LIS Staff Interest and tagged Library Spotlight, LibrarySpotlight, libspotlight, MIDCAT, Service Outages on September 28, 2018 by Terry Simpkins. In preparation for our migration of the Middlebury and MIIS library catalogs to a new version of Innovative Interfaces, Inc., software, the library catalog (MIDCAT) will be unavailable on Monday, June 11, 2018. The library will remain open, but you will not be able to check out, return, or renew materials until the system upgrade is complete. We do expect Summon (go.middlebury.edu/summon) to remain functional if you need to search our journals and databases, or if you simply want to use it to lookup an item to see if the library owns it. Thank you for your patience, and we apologize for any inconvenience. This entry was posted in LIS Staff Interest and tagged MIDCAT, Service Outages on June 4, 2018 by Terry Simpkins. This is another reminder that MIDCAT will be unavailable on Tuesday, Mar. 6, between 4AM-8AM. This includes staff client side functions as well as the webPAC (go/midcat/) and includes all lookup and checkout functions, among other services. This entry was posted in Library, LIS Staff Interest, Middlebury Community Interest and tagged MIDCAT, Service Outages on March 5, 2018 by Terry Simpkins. Literatures & Cultures Librarian Katrina Spencer has a few words to share about MIDCAT and Summon. 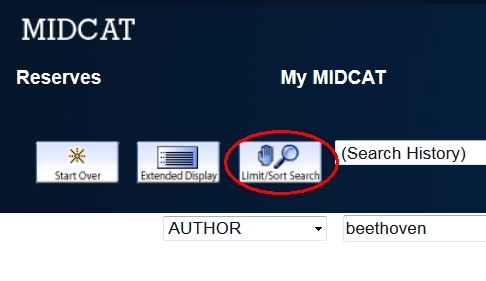 This is Katrina Spencer, the Literatures & Cultures Librarian and this post is for everyone who uses MIDCAT and Summon to navigate library resources. At this point in the semester, however, the message is primarily for students. Students, as you prepare for your end-of-year assignments, I want to tell you a bit about how I use both MIDCAT and Summon differently. If you speak to another librarian, you will likely get a whole new set of ideas, interpretations and uses, which is good and enriching. Take a look below to see my impressions and visit the rest of the team at the Research Desk for more conversation on this topic. MIDCAT ~ Will provide results for library materials including print books, e-books, DVDs, CDs, VHS, government documents, sheet music, microfilm and microfiche, and a variety of technological equipment held in Davis Family Library, Armstrong Library in Bicentennial Hall, Davison Library at Bread Loaf, Twilight, etc. I am searching for an exhaustive list of materials by Subject, for example, “Abenaki,” as depicted in the screenshot with 78 results. 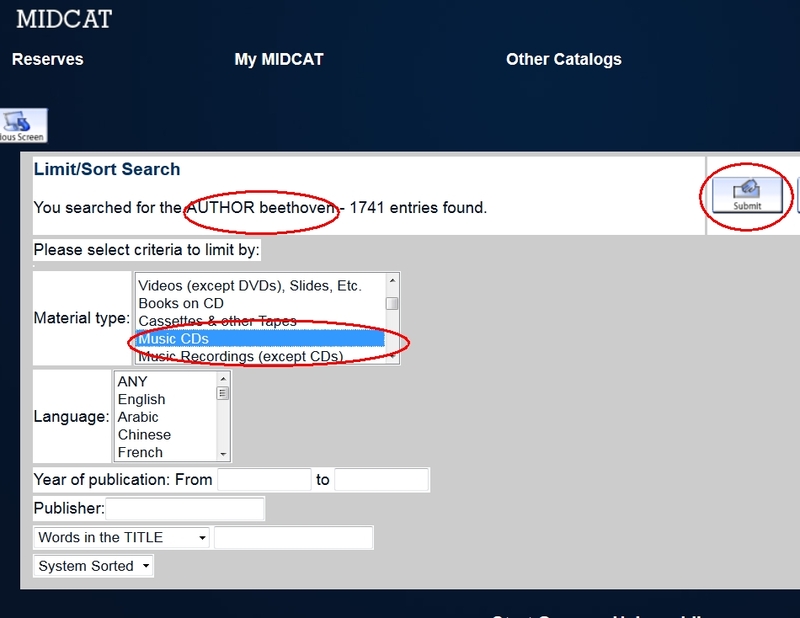 Advanced search menu showing one way to search MIDCAT for Middlebury’s film collection by language. Summon ~ Except for some relatively small types of material such as the tech equipment the library makes available for loan, Summon will provide results for almost everything MIDCAT holds AND other library materials including databases, journal articles, photographs, dissertations and theses, magazines, newspapers, sound recordings and more. You can also use Summon to search libraries other than Middlebury’s. I am looking for journal articles. I am looking for something I’m not sure exists. This is a screen capture of the advanced search screen in Summon. This box holds dozens of content types and these three examples — interactive media, journal/e-journal and journal article– are a limited selection of what is available. I am looking for materials held by libraries other than Middlebury. 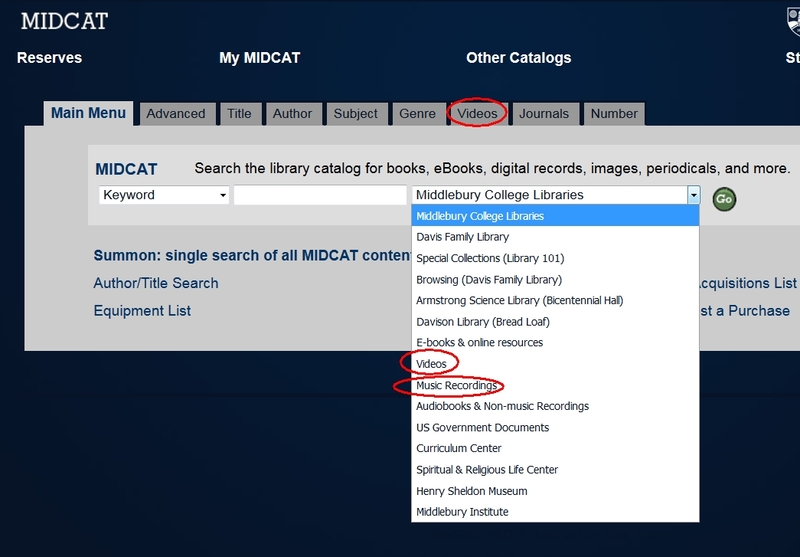 After entering a search in Summon, users can select “Add results beyond your library’s collection,” indicated above with a red arrow, to review holdings outside of Middlebury’s resources. “Boolean” searches are helpful, employing “AND,” “OR,” and “NOT” to limit or increase my results. I welcome you to comment on anything I missed and to introduce new approaches. Visit the bottom of the page at go.middlebury.edu/askus to see the times at which the Research Desk is staffed, more than 40 hours a week, and visit go.middlebury.edu/librarians to find discipline-specific specialists. 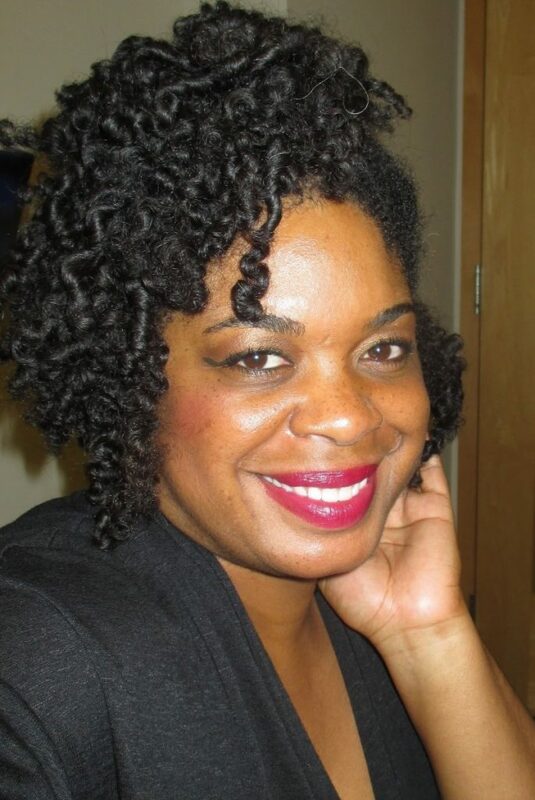 This entry was posted in libitsblog, Library, Library News, libspotlight, LIS Staff Interest, lisblog, Middlebury Community Interest, middpoints, Post for MiddNotes, Post for MiddPoints and tagged Library Spotlight, libspotlight, MIDCAT, Summon on December 5, 2017 by Katrina Spencer. What’s With This “Quick Search” Thing…? This entry was posted in Middlebury Community Interest and tagged library, library catalogs, lis website, MIDCAT, Research & Collection Services, Research & Instruction, search on September 11, 2012 by Terry Simpkins. Welcome to the summer Language School and Breadloaf students. Begin your research, searching for articles across both databases and MIDCAT (the library catalog) with Summon. 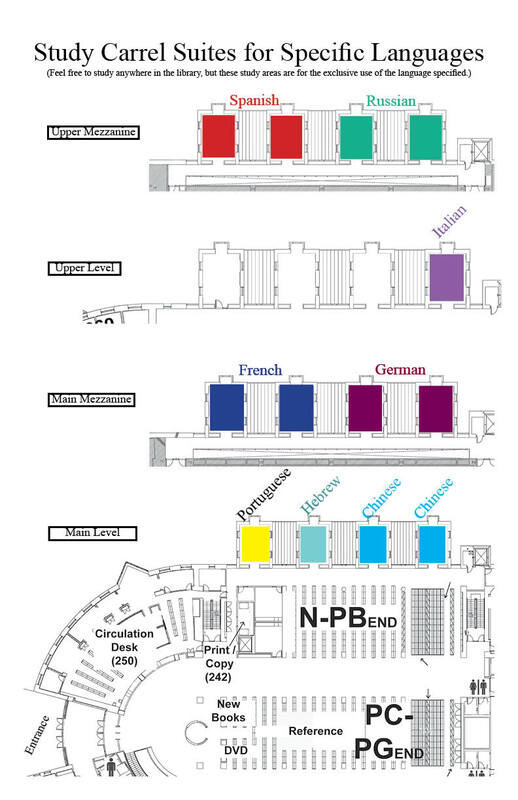 The music collection has moved into the Davis Family Library, link here to view a map depicting the updated location of materials. If you have any questions please don’t hesitate to Ask a Librarian. This entry was posted in Middlebury Community Interest and tagged Bread Loaf School of English, Facebook, Language Schools, Library Spotlight, MIDCAT, Summon on June 24, 2011 by Joy Pile. Are you interested in receiving automatic weekly updates for new library acquisitions? 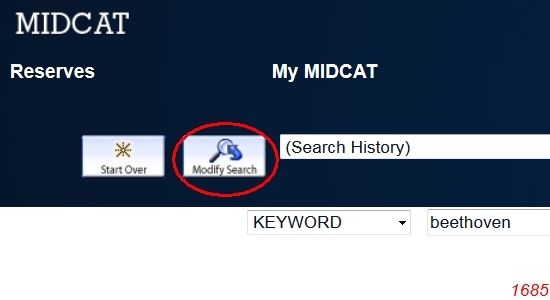 The easiest way to do this is to set up a preferred search in MIDCAT and select the option to Mark for Email. This generates a weekly email listing any new materials matching your search criteria. Note that if no new materials match your search terms for a given week you won’t receive an email. You may set up multiple search alerts, as needed. This entry was posted in LIS Staff Interest and tagged acquisitions, CDs, Did you know?, DVDs, Facebook, Library Spotlight, MIDCAT, Research & Collection Services, resources on March 8, 2011 by Bryan Carson. 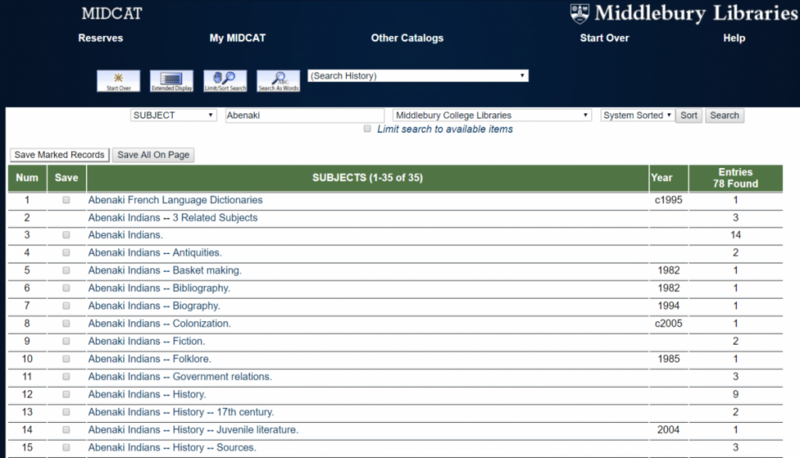 The Cataloging department has added a genre/subject field in MIDCAT records for books that have been written, edited, or contributed to by Middlebury faculty. Try doing a MIDCAT genre search for Faculty authors, and you’ll see all the titles that currently appear on the shelves of the Davis Library faculty authors section. We’ve probably missed some titles, so faculty members, if there is a title missing from this list, let me know, and I’ll add the field to the record. This entry was posted in LIS Staff Interest and tagged Library Spotlight, MIDCAT, Research & Collection Services on January 12, 2011 by Richard Jenkins.